Bundy Proceedings to Remain Shrouded in Secrecy | RANGEfire! In order to maintain public confidence in a civil society, not only must justice be done, it must also be seen to be done. Reposted from Mesquite Local News. This past week Nevada’s Chief U.S. District Judge Gloria Navarro upheld a sweeping protective order by a federal magistrate that seals documents and gags participants in the pending trial of Cliven Bundy, four of his sons and a dozen co-defendants on charges resulting from the April 2014 standoff at Bundy’s Bunkerville ranch, because that information might be used to intimidate witnesses. The protective order was challenged by the Las Vegas Review-Journal, this newspaper and The Associated Press, which argued the order was overly broad and would prevent public scrutiny of a high-profile and significant case. But she later declared in the 10-page ruling, “The Intervenors proffer nothing but assumptions and conjecture about whether true threats were made as opposed to idle threats. This speculation does not refute (U.S. Magistrate) Judge (Peggy) Leen’s finding of good cause, let alone demonstrate clear error,” though the original order was based largely on assumptions and conjecture about largely anonymous Internet rants. Navarro also dismissed as inefficient and impractical suggestions that certain information could be selectively redacted, instead of everything being sealed in its entirety as soon as it is filed, due to the fact the case involves 1.4 terabytes of digital information. Freeing court personnel from a little paperwork trumps the unfettered ability of the defendants to have the public spot flaws in the documents and testimony that will determine whether they are to be incarcerated or freed? The judge warned that defense attorneys may not even share notes relating to the contents of discovery with anyone not employed to assist the defense, and anything filed in court relating to the discovery must be filed under seal. Leen reasoned that victims and witnesses could be vulnerable to “cyberbullying, threatening communications, and intimidation from Bundy supporters,” which could have a chilling effect on witnesses. She determined this even though almost all of the 22 allegations of intimidation are more than two years old and nothing substantive has come of any of them. The defendants face felony charges that include conspiracy, obstruction, extortion and assault, which carry penalties of up to 50 years in prison. The standoff occurred after armed Bureau of Land Management law enforcement agents attempted to roundup Bundy’s cattle after he had refused for 20 years to pay grazing fees in the Gold Butte area. The BLM said he owed $1 million in fees and penalties. Faced with armed protesters the BLM agents eventually released the cattle and left to avoid potential bloodshed. Wish you were covering the ‘standoff’ here in North Dakota! Multiple county and 9 state’s LE’s have spent $17 million so far, protecting a huge corporate entity from a fairly large gathering of Indigenous Nations united in prayer to protect Mother Earth and her iifeblood – water. Less-than-lethal weapons have required medical attention for many and the loss of an eye in one victim along with a forearm nearly blown off in another. 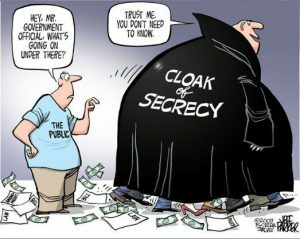 Talk about ‘shrouded in secrecy’! Who hears? Thanks Donna. We have tried to provide a fair amount of coverage and commentary about North Dakota. We have delved into it enough to be able to see that, as with everything, there are multiple sides to the story, and much more to the equation than meets the eye. As per usual, there is no question that the Mainstream Media’s narrative is very biased, and doesn’t tell the whole story. Wish we could do the situation justice. If you would like to write something helping to paint the whole picture, we would be happy to post it. Thanks for sharing your time in reference to Bundy Ranch on RBN radio this morning. You are courageous, bold and intelligent. In spite of the treatment by some of the callers, your information and outstanding service to ‘the liberty movement’ are of great value.